A review of the case is to be announced today. 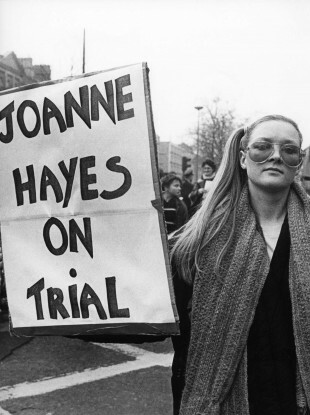 A woman protests during the Kerry Babies Tribunal. GARDAÍ ARE TO announce a review into the death of a newborn baby in Kerry in the 80s, two years after the family of a woman wrongly accused of the murder called for DNA samples to be tested. The body of an infant baby boy was found on White Strand beach at Cahersiveen in Kerry on 14 April 1984. He had been stabbed to death. Last night’s Claire Byrne Live programme reported that gardaí have obtained a full DNA profile of the baby. Gardaí will announce today that the review is being conducted by investigating officers in Cahersiveen supported by the Serious Crime Review Team. A press briefing is to be held in the Co Kerry town this afternoon. Joanne Hayes was a 25-year-old woman from Abbeydorney, north Kerry, who had been known to be pregnant, and was soon arrested by gardaí as part of their investigation. A murder probe and a subsequent tribunal of inquiry would absolve her of any wrongdoing. It would later transpire that the child she was carrying was stillborn. She had panicked and buried the child in a field near her home. Two years ago, the family’s solicitor Pat Mann released a statement which said that Hayes had no problem in submitting a sample of her blood which could be tested against a sample of tissue of the dead child which was retained by the State. DNA testing was not available in the 1980s. Now that a DNA profile has been established for the murdered child, it is hoped that his family can be identified. Gardaí believe this could help end the mystery of the child’s violent death. Joanne Hayes was an unmarried woman who had a relationship with a married man and became pregnant. She already had another child, a daughter who she was raising at home. The first baby, the boy found at White Strand was baptised, and named John. Joanne Hayes’ murder case and the 1985 tribunal seared the Kerry Babies case into the national consciousness, demonstrating the attitudes towards women, family and religion in 1980s Ireland. TheJournal.ie will be reporting live from the scene of today’s Garda briefing in Kerry. It’s due to commence at 2pm. Email “Kerry Babies: DNA breakthrough comes two years after family appeal to have samples tested”. Feedback on “Kerry Babies: DNA breakthrough comes two years after family appeal to have samples tested”.